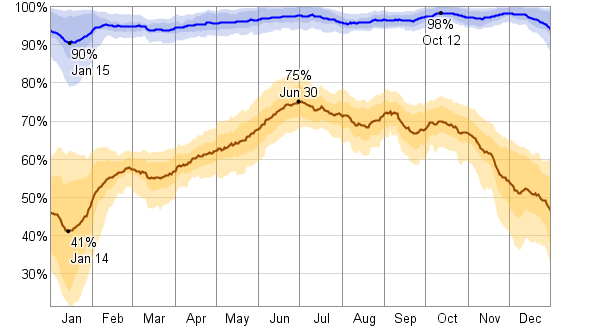 Very dry weather, with humidity plumbing levels below 20% daily, which is more or less outside the range of experience according to this graph. - feel cold, like in any desert, the temperature ranges wider now that it's dry - colder nights/mornings, hotter afternoons. - can't stand the dust and pollution. Sometimes I can taste sand. - have actually got colds, the flu or such. I have. I ended up taking medicine. - feel super hungry. Last week was the worst - I just had to keep eating. It felt crazy to be hungry every hour or two, but what could I do? Some people just report feeling thirsty. - don't want to get out of bed. I'm sure it's for times like this that our more organic-living brethren (including the burrowing crew) discovered hibernation. Biologically, we would probably do well to shut it down and get back to the business of money and such in January. But we have calendars to run. I feel lazy. 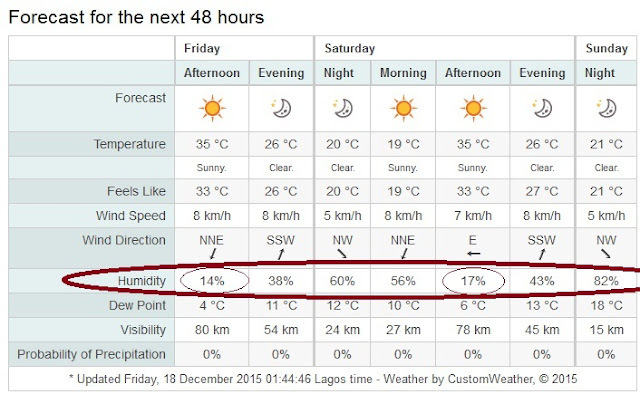 I feel like King David, walking through the cold valley of the dark shadow of harmattan. In two weeks, I will break through to the other side. I fear no evil. This too shall pass. People are still doing this blog thing. This is what happened when I clicked the relic "Next Blog" link at the top of this blogger page: Blog 1, which led me to Blog 2, Next Blog 3, Blog 4, then Blog 5.
art: illustration, painting, photos, technique, babies and children.